Continuous renal replacement therapy (CRRT) is used to treat acute kidney injury of critically ill patients admitted in the intensive care unit. Patients with acute renal failure along with complications such as imperfections or multiple organ failure in their circulatory system or cardiac that include edema and cardiac insufficiency are also treated by the use of CRRT. The other complications for which CRRT is used include postoperative liver failure, fulminant hepatitis, serve acute pancreatitis, and multiple organ failure. In 2016, continuous renal replacement therapy was valued at nearly US$ 700.0 Mn and is anticipated to register a CAGR of over 6.5% from 2017 to 2025 to reach value of approximately over US$ 1000 Mn by 2025. Increasing number of dialysis centers across the world is likely to fuel expansion of continuous renal replacement therapy from 2017 to 2025. In CRRT, the fluid status of the patients is controlled with the help of an electrolyte solution the patient’s blood is cleaned, the uremic toxins are removed, acid-base abnormalities, and electrolyte are corrected, and extracorporeal blood circuit is required. Increasing prevalence of acute kidney injury drives the expansion of the market from 2017 to 2025. The sudden failure of kidney due to various indications leads to acute kidney injury. All over the world, every year approximately 3 million end-stage renal disease patients, and 470,000 end-stage renal disease patients in the U.S. are dependent on life-sustaining dialysis treatment. In the next 10 years, the number of patients is anticipated to double. According to U.S. data, 5% to 20% experience acute kidney injury during their course of illness in the ICU, and as acute kidney injury develops, there is a huge negative impact on outcomes of any illness. The global continuous renal replacement therapy market has been classified on the basis of mode, product, therapy, end-user, and region. Based on mode, the market has been categorized into slow continuous ultrafiltration, continuous veno-venous haemo-filtration, continuous veno-venous haemo-dialysis, and continuous veno-venous haemo-dia-filtration. Among these, continuous veno-venous haemo-filtration segment leads the market and is expected to continue its dominance during the forecast period followed by continuous veno- venous haemo-dialysis. The high market share of continuous veno-venous haemo-filtration segment is attributed due to CVVH is more effective than continuous veno-venous haemo-dia-filtration (CVVHDF), and may be associated with fewer complications. In terms of product, the market has been classified into dialysate and replacement fluids, disposables, and systems. Disposables can further be divided into bloodline sets, haemo-filters, and other disposables. Among products, the disposables segment held the largest market share in 2016 and is anticipated to gain market share from 2017 to 2025. The expansion of the segment is attributed to the high volume sales of the disposables for continuous renal replacement therapy. Among the sub segments, haemo-filters held the maximum market share in 2016 and is projected to dominate the market during the forecast period. Based on therapy, the market has been segmented into renal, non-renal, and combination of both. Among therapies, renal segment held maximum share in 2016, and is anticipated to dominate the market from 2017 to 2025. This large market share is attributed to increasing prevalence of acute kidney injury. However, the combination of both renal and non-renal segment is anticipated to grow at the highest rate owing to increasing geriatric population all over the world. In terms of end-user, the market has been categorized into hospitals, clinics, and homes. Among the end-users, hospitals segment held the largest market share in 2016 and is anticipated to lead the market from 2017 to 2025. This is attributed to increased number of intensive care units all over the world. However, homes segment is projected to expand with the highest CAGRfrom 2017 to 2025. Geographically, Europe captured maximum share of the global continuous renal replacement therapy market in 2016. The reason for the dominance of the region is because Europe is home to many key players of the global continuous renal replacement therapy market. The market in Asia Pacific is anticipated to expand at the highest growth rate from 2017 to 2025. The increasing government initiatives in the healthcare sector by developing countries of the region are projected to fuel the growth of the market. Initiatives by local governments to attain self-sufficiency in manufacturing medical devices is likely to boost market growth in Middle East & Africa and Latin America. Major companies operating in the global continuous renal replacement therapy market and profiled in the report include Baxter International, Inc., Fresenius Medical Care AG & Co. KGaA, Asahi Kasei Medical Co., Ltd., B. Braun Melsungen AG, Bellco, NxStage Medical, Inc., Nipro Corporation, NIKKISO CO., LTD., Toray Medical Company Limited, and INFOMED SA. These players adopt inorganic, and organic growth strategies to drive their device offerings, strengthen their reach all over the world, garner market share, and increase their customer base. This report on the global continuous renal replacement therapy market analyzes the current and future scenario of the global market. Increasing prevalence of acute kidney injury, increasing government initiatives to deal with acute renal failure, and rising geriatric population all over the world are projected to drive the growth of the market during the forecast period. The global continuous renal replacement therapy market report comprises an elaborate executive summary, which includes a market snapshot that provides information about various segments. It also provides information and data analysis of the global market with respect to the segments based on mode, product, therapy, end-user, and geography. A detailed qualitative analysis of drivers and restraints, opportunities and trends has been provided in the market overview section. Additionally, the section comprises market merger and acquisition deals to help understand the scope of the market. 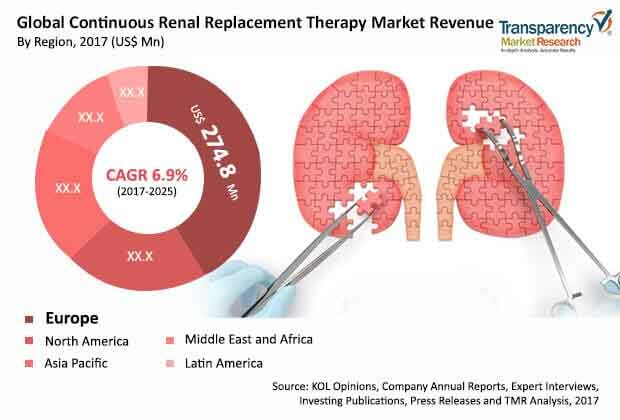 This section also provides market attractiveness analysis in terms of geography and market share analysis by key players, thus presenting a thorough analysis of the overall competitive scenario in the global continuous renal replacement therapy market. The global continuous renal replacement therapy market has been classified on the basis of mode, product, therapy, end-user, and region. Based on mode, the market has been categorized into slow continuous ultrafiltration, continuous veno venous haemo-filtration, continuous veno venous haemo-dialysis, and continuous veno venous haemo-dia-filtration. In terms of product, the market has been classified into dialysate and replacement fluids, disposables, and systems. Disposables can further be divided into bloodline sets, haemo-filters, and other disposables. Based on therapy, the market has been segmented into renal, non-renal, and combination of both. In terms of end-user, the market has been categorized into hospitals, clinics, and homes. Geographically, the global continuous renal replacement therapy market has been categorized into five major regions and a key countries in the respective region: North America (the U.S and Canada), Europe (Germany, France, Italy, Spain, U.K, and Rest of Europe), Asia Pacific (China, Japan, India, Australia & New Zealand, and Rest of Asia Pacific), Latin America (Brazil, Mexico, and Rest of Latin America) and Middle East & Africa (South Africa, GCC countries, and Rest of Middle East &Africa). The report also profiles major players in the global continuous renal replacement therapy market based on various attributes such as company overview, financial overview, product portfolio, business strategies, SWOT analysis, and recent developments. Major players profiled in this report include Baxter International, Inc., Fresenius Medical Care AG & Co. KGaA, Asahi Kasei Medical Co., Ltd., B. Braun Melsungen AG, Bellco, NxStage Medical, Inc., and other prominent players.